Sustainable energy can be understood as the combination of conservation and energy efficiency (demand approaches) with renewable energy sources (supply approaches) to reliably satisfy all type of energy needs. Through this viable energy strategy, entire continents, individual nations, and local communities can achieve valuable benefits, including energy security, resilience, climate protection, new employment opportunities, and lower environmental pollution levels. Conservation and energy efficiency are often conflated as synonymous terms as they both aim to achieve a similar objective (i.e. doing more with less). However, achieving energy demand minimization requires addressing conservation and efficiency simultaneously. Conservation involves behavioral changes that allow society or individuals to use less energy by changing their energy use habits and practices. Energy efficiency involves adopting technologies that maximize energy services while using as little energy as possible. Paradoxically, if we implement energy efficiency technologies, without introducing strong conservation strategies, overall energy use will soon increase. To ensure that conservation and energy efficiency initiatives become developed to their full potential, many leading jurisdictions have implemented specialized agencies and leading think tanks provide guidance on this key sustainable energy strategy. The term ‘renewable energy’ refers to using technological and design solutions to harness solar, wind, biomass and hydro sources to satisfy all types of energy needs (e.g. transportation, electricity generation, heating and cooling of buildings, productive uses, food production, water purification). The use of renewable energy sources requires careful planning to deal effectively with resource variability; to ensure that local communities participate actively and benefit from projects; and to achieve the lowest possible ecological impact. Renewable energy sources represent the second biggest source of primary energy supply worldwide. Currently, fossil fuels supply 78% of global energy supply. However, the United Nations Intergovernmental Panel on Climate Change (IPCC) and all of the world’s best scientific academies identify the use of fossil fuels as the main culprit behind climate change. Achieving planetary climate security requires that fossil fuel dependency is stopped as soon as possible in favor of a global ramp-up on the use of renewable energy sources. Achieving that supply transformation will require strong political commitment and smart policy changes. Unfortunately, the use of fossil fuels is deeply ingrained and it is buttressed by over two hundred years of technological and economic support. Worldwide, energy subsidies today still vastly favor fossil fuel and nuclear energy instead of sustainable energy strategies. For example, the International Energy Agency's latest estimates indicate that fossil-fuel consumption subsidies worldwide amounted to $523 billion in 2011, up from $412 billion in 2010. 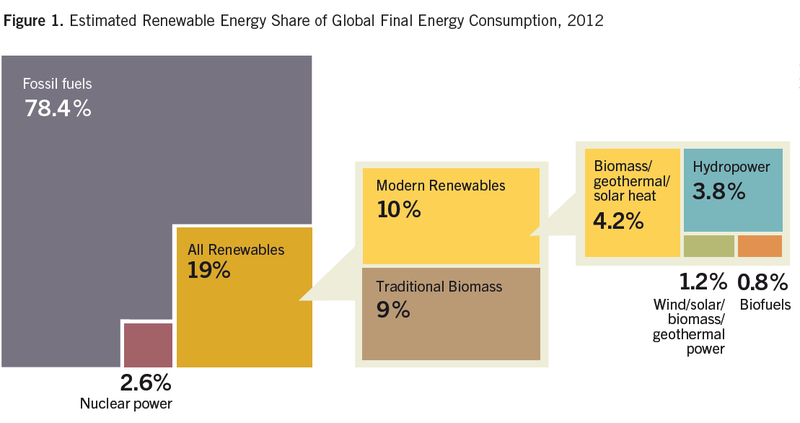 The good news is that technological development for key renewable energy solutions (e.g. solar, wind, and biomass) is advancing rapidly and in the last decades the prices of many key renewable energy technologies have become highly competitive. Smart and consistent policies are essential to accelerate the widespread adoption of renewable energy, conservation and efficiency. Sustainable energy policies are required to address financial and economic barriers and to ensure that nations and local communities can have the necessary expertise in place to implement effective projects. Smart policies are crucial to ensure that entrenched price inequalities can be eliminated quickly and to ensure stable investment on renewable energy, conservation and efficiency. Smart policies are also essential to ensure that renewable sources, conservation and energy efficiency strategies are prioritized at all times over polluting and finite energy sources. Leading sustainable energy nations (such as Germany) have implemented comprehensive policies that include renewable energy laws, incentive programs such as feed-in tariffs , carbon trading and carbon taxation programs, generous research and development support for renewable energy and a nuclear phase-out which, combined, ensure that renewable energy projects are more easily implemented and prioritized. The European Union (EU), through its 2020 Directive, provides a valuable policy example of an entire region that is working collaboratively to ensure that conservation, efficiency and renewable energy use are all maximized through clear targets and timelines that are combined with detailed national energy planning. The creation of the International Renewable Energy Agency represents another example of a new global effort that is actively focused on promoting sustainable energy approaches worldwide. Achieving widespread implementation of renewable energy, conservation, and efficiency strategies involves substantial challenges and will require new thinking, innovation, and strong political commitment to develop these sustainable energy solutions to their full potential. The world is at a crossroads, as current trends indicate that political and economic support for sustainable energy needs to increase from current levels to ensure that the multiple social and environmental benefits of this innovative energy paradigm are fully achieved. The United Arab Emirates is a hot and dry country where petroleum has generated fabulous wealth for residents. Using proceeds from this one-time extraction of oil deposits as financial capital, Abu Dhabi, one of seven emirates, envisions a transformation of its role, from a world leader in petroleum production to a world leader in energy in a world without petroleum. As part of this vision, Masdar City ‒ a mixed-use, compact, zero-waste, zero-carbon, car-free city powered by renewable energy ‒ is rising from the desert (Foster + Partners 2007). The driver that has made financing this city possible, petroleum, is being replaced by a new generation of energy sources. Working with the World Wildlife Fund, the government of Abu Dhabi has developed the Masdar Initiative to align with One Planet Living sustainability standards. The One Planet Living principles, all ten integrated into Masdar City, include zero carbon; zero waste; sustainable transport; sustainable materials; sustainable food; sustainable water, habitats, and wildlife; culture and heritage; equity and fair trade; and health and happiness (World Wildlife Fund 2008). If any place on Earth seems appropriate for staying indoors within sealed, air-conditioned buildings, it is here, in an extremely hot desert climate where average summertime temperatures hover above 100 degrees Fahrenheit during the day. But the planners and designers have chosen to go a different direction, bringing together limited air conditioning with passive cooling strategies that require no additional water or energy. Buildings, streets, and urban spaces are carefully oriented and configured to maximize cooling and minimize energy use. Solar exposure of paving is minimized, as are reflective walls on buildings that might magnify the solar radiation reaching streets below. The orientation of buildings and streets blocks hot winds during the day but allows cooling breezes to enter at night. Some buildings are set as close as 10 feet apart, with ground floors stepped back under colonnades along short streets. This traditional Middle Eastern form shields spaces from sunlight and helps to accelerate air movement, reducing the demand for air conditioning. When air conditioning is needed, it is powered by renewable energy generated within the city. Buildings use night flushing and stack ventilation to pull air through interior spaces. At night, cool air is drawn in; during the day, thermal mass helps to keep temperatures stable. Wind towers or wind catchers, vertical shafts with vent openings on top which pull cooling air through the space below, are a traditional cooling strategy in the Middle East. They are used to cool Masdar City’s public spaces; water mist is sprayed from the top of the tower, where evaporative cooling and moving air help to lower perceived temperature for people at the tower’s base. Buildings provide foyers as thermal transition zones, so that residents do not feel a thermal shock when moving between indoors and outdoors; rather they acclimatize gradually, allowing them to feel relatively comfortable at indoor temperatures around 86 degrees Fahrenheit (Taylor 2008). Outdoors, designers placed parks and public spaces three levels below the streets. These “urban wadis,” protected from the sun by building overhangs and canopies of native desert trees, become reservoirs for cool air. Cool seawater from 40 to 46 feet below the water’s surface runs through what designers call cool-water flush canals. In addition, very slight temperature differences between deep, cool seawater nearby and the air at street level are used to drive heat exchangers. Open spaces are woven throughout the city to provide coolness, cleaning of air, and connection to nature. Surfaces are used with care. Horizontal non-walking surfaces, including roofs, are covered with native green plants which can be irrigated with brackish well water mixed with graywater. Cold plates embedded in public walkways provide radiant cooling underfoot, while cool mist stations provide evaporative cooling from above. Masdar City does not have viable freshwater sources, and all water supplies brought in use desalination (Novotny, Ahern, and Brown 2010: 571). In Masdar City, 80 percent of the water used is recycled (ibid. : 568). Stormwater, graywater including cooling-tower condensate, and even blackwater are treated and then used for irrigation, toilet flushing, district cooling, and other uses. Dashboard panels inside buildings allow inhabitants to track how much water they use, along with other characteristics including carbon footprint. Ninety-nine percent of the city’s waste is recycled or recovered (Bellini and Daglio 2008: 296). The city turns organic waste into compost to build soils, recovers or recycles nonorganic waste, and has plans to use the remainder to produce power in a waste-to-energy plant. Masdar City is car-free, with no petroleum-powered cars allowed inside. Every dwelling is located within a short walking distance of a transportation hub. An innovative public transportation system known as Personal Rapid Transit (PRT) uses small, driverless vehicles powered by electricity and guided by magnets. Electric-power light rail lines cross the city and connect it with nearby regions. Solar photovoltaic panels are used throughout the city, and a photovoltaic solar farm outside the city generates 10 megawatts of power while avoiding carbon dioxide emissions (Masdar Clean Energy 2012). A utility-scale, parabolic-trough concentrating solar power plant, also located outside the city, generates 100 megawatts of power (Novotny, Ahern, and Brown 2010: 570). The Masdar Institute of Science and Technology, a cooperative program between Abu Dhabi and the Massachusetts Institute of Technology, is a graduate and postgraduate teaching and research facility which is part of Abu Dhabi’s vision to become a world leader in post-fossil fuel energy. The technologies in Masdar City are not new. Solar panels, waste-to-energy plants, graywater reuse, passive cooling, electrified public transit, and other strategies are all used already in other parts of the world. What is innovative about Masdar City, however, is that not just some but all of these strategies are brought together in an integrated, cohesive urban system. Bellini, Oscar E. and Laura Daglio. New Frontiers in Architecture. Vercelli, Italy: White Star, 2008. CH2M HILL. “Water Portfolio Management: Understanding Challenges Around the World.”CH2M HILL, 2008.
no. 15 (September 2008): 50–55. Foster + Partners. “Foster + Partners Create the World’s First Zero Carbon, Zero Waste City in Abu Dhabi.” Press release, London, 2007. Hartman, M., M.B. Knell, and J.W. Witherspoon. “Masdar City’s Integrated Approach to Sustainability.” In Proceedings, Cities of the Future 2010 conference, March 7–10, 2010, 104–17.Cambridge, MA. Madichie, Nnamdi O. “Irena Masdar City (UAE) Exemplars of Innovation into Emerging Markets.” Foresight, vol. 13 no. 6 (2011): 34–47. Nambiar, Sona and Joann Gonchar. “Masdar Institute.” Architectural Record, vol. 199 no. 5 (May 2011): 130. Novotny, Vladimir, Jack Ahern, and Paul Brown. Water Centric Sustainable Communities: Planning, Retrofitting, and Building the Next Urban Environment, 566–73. New York: John Wiley, 2010. Taylor, Bill. “Landscape on the Edge: A Cooler and Greener Middle East.” Landscape Magazine ‒ Middle East, issue 14, August 2008. Vidal, John. “Masdar City ‒ A Glimpse of the Future in the Desert.” Guardian, April 26, 2011. WSP. Masdar City Case Study. London: WSP Group, 2009. Scatter Easter eggs or some other chocolate treats in a range of hiding places, including some that will require considerable effort to retrieve. Make sure there are large numbers of chocolates in some locations and very few in others. When participants arrive, give them a certain amount of time to collect the chocolates. Work out who has won the Captain of the Chocolate Industry Award for the exercise. Complete the activity by getting people to indicate on a mud-map the location of the goodies they retrieved. How much of your bounty was retrieved from near or more distant hiding places? What would be a rough estimate of the time taken to retrieve each item? Who won the Captain of the Chocolate Industry award and why did they succeed? How does this exercise relate to Energy Return on Investment (EROI) calculations? How does the exercise relate to recent trends in oil exploration? First ask students, in groups, to identify and describe these views of the future: Positive; Negative; Essentially the same as now. Then ask each student to explain to the rest of their group which view of the future they personally find most likely, and why. Then get each student in the class (or each group) to come to the whiteboard and enter the reasons for their opinion (whether positive or negative) in one of two columns (positive or negative). Then, as a class, they can start to see what connections there may be between the two columns, e.g. do any elements cancel each other out? The point is to start to see how ‘dichotomous’ much of our thinking about the future actually is, i.e. it lacks subtlety or a willingness to embrace uncertainty. This YouTube video was produced by Legalise Freedom (www.leaglise-freedom.org). It features an interview with Joseph Tainter about his two books, The Collapse of Complex Societies and Drilling Down (written with Tadeusz Patzek). A 2012 video produced by the US-based Arthur Morgan Institute for Community Solutions (www.communitysolutions.org). It argues that Cuba’s experience in having to deal with the sudden loss of oil supplies following the collapse of the Soviet Union in 1989 shows that local communities are capable of dealing with the gathering global crisis of ‘peak oil’. A 2012 TEDxExeter talk by Transition Towns Network founder Rob Hopkins, in which he tells the story of how the town of Totnes embraced his ideas for relocalising food production. This documentary nicely outlines the connection between food production and energy (in particular, oil). It outlines the concept of Peak Oil and then applies it specifically to food production and distribution. Refers to the Cuban experience. A TEDxZurick talk by Roman Gaus, who surprised himself when he got involved in urban food production. A very popular presentation. This video presents the story of Novella Carpenter, who started small in growing food in an abandoned parking lot in the ‘food desert’ of west Oakland before progressing to bigger and better things. A short video which shows how people can join in an activity that might at first seem unattractive. A TED talk by Amory Lovins, sustainability advocate. A website resource produced by the International Energy Agency (IEA) which allows the user to generate Sankey graphs ‒ essentially flow charts showing overall energy inputs and outputs ‒ for the great majority of countries in the world. These are quite useful for demonstrating comparative energy usage for various countries. This valuable website is now defunct but it has been saved in its entirety as an online resource. The archives include articles on energy trends/developments and their socio-political, technological and economic consequences. It can be searched according to country to provide country-specific content. Whilst this material will inevitably date, the website was still active up until 2013 and there are general background articles and resources which are really useful. The International Energy Agency was formed in 1973/74 at the time of the first global oil ‘shock’ and its aim has been to examine ways to use existing energy supplies more efficiently while stepping up the search for alternative energy sources. The non-aligned agency has 29 member countries and it provides information on trends in the use of various energy sources. It publishes an IEA Journal.